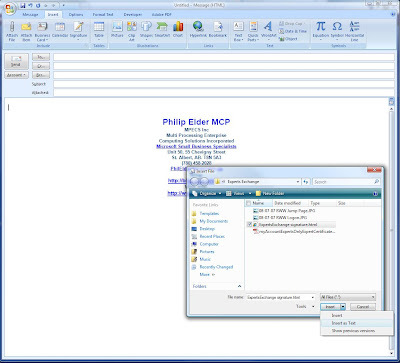 My Outlook 2007 does not show an Insert File dialog. I can insert a file via Insert Object, but the dialog is completely different. Do I need to enable something to view the Insert File dialog you reference? In the blog post, click on the image under "Insert as Text" to see the full view. There is a little down arrow on the right side of the Insert button that you click on to bring up the menu. Are you saying that you do not see that arrow? Phillip - thanks for the quick reply. The Insert File dialog box that the image shows does not appear in my Outlook installation. I can work around it, but the resulting email body does not include all the html features of the source file - background image, etc. Also - if I try to use File | Send | page by e-mail from IE7, the resulting email body does not include all of the source HTML. Seems to be a general Outlook HTML rendering issue. On a domain? Group Policy setup to manage your Outlook installation? The install routine too may be a factor in that feature not showing up. I will have a look at some other domain and non-domain Office 07 installs to see if this is the case there too. It does seem strange that the down arrow would be missing for you. I tried this technique in a meeting request but the HTML just showed up as code...any way to insert HTML or linked graphics into meeting requests?